This posting is one of many that finds the researcher veering off in multiple, often surprising directions. In this case some of the subjects coming into the spotlight are film, furniture, wine, maritime disasters, and artists. One subject always leads to the next, and of course, this happily meandering path could go on indefinitely. The courtyard gets it’s name from Pierre Ernest (or Ernest Pierre, city directory records show both) Brulatour, born about 1802, who came to New Orleans at about age 34, according to an online immigration record. 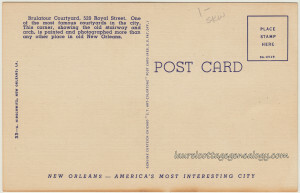 He was a wine merchant in New Orleans, having lived for a time at the Royal Street address on the postcard, and was the paternal grandfather of Pierre Ernest Jules Brulatour (1870 – 1946.) The younger Brulatour is said to have been named after the grandfather. (Possibly they both had the same exact name but that question will not be looked into here.) Much has been written about Jules Brulatour, the grandson, who was a very successful pioneering figure in the early American film industry. An interesting fact about Jules’ second wife, Dorothy Gibson, is that not only was she a survivor of the Titanic disaster, but she played herself (prior to her marriage to Jules) in Saved From the Titanic, the first movie ever made about the maritime tragedy. Logically, the film’s producer was Jules Brulatour. The building depicted here is said to have been built in 1816 and first occupied by François Seignouret, a fine furniture maker and wine merchant, born 1783 in Bordeaux, France. Seignouret’s furniture is famous for it’s elegant lines and is highly sought-after, and the wine business that he founded in 1830 is still in operation today, as Seignouret Frères & Cie.
520 Royal Street was also, at one time, home to the Arts and Crafts Club of New Orleans, a group of artists that organized to form the club, and are recognized as a major force in starting the movement to preserve the historic French Quarter. They had moved in to the building in December of 1921. The club incorporated in 1922 and ran till 1951, and though they only headquartered at the 520 Royal address for a short number of years, they are nevertheless, an important part of it’s history. The building and courtyard are owned today by The Historic New Orleans Collection, who are currently working to turn the site into a historical museum, with a vision that includes the site as a venue for music and art. The site excavators have made a fascinating discovery of a 200 year-old well. Ancestry.com. U.S. and Canada, Passenger and Immigration Lists Index, 1500s-1900s [database on-line]. Provo, UT, USA: Ancestry.com Operations, Inc, 2010.Original data: Filby, P. William, ed. Passenger and Immigration Lists Index, 1500s-1900s. Farmington Hills, MI, USA: Gale Research, 2012. Hemard, Ned. “Jules Brulatour.” In KnowLA Encyclopedia of Louisiana, edited by David Johnson. Louisiana Endowment for the Humanities, 2010–. Article published August 26, 2013. http://www.knowla.org/entry/1616/. Bonner, Judith H. “Arts and Crafts Club of New Orleans.” In KnowLA Encyclopedia of Louisiana, edited by David Johnson. Louisiana Endowment for the Humanities, 2010–. Article published January 3, 2011. http://www.knowla.org/entry/474/. Year: 1930; Census Place: New Orleans, Orleans, Louisiana; Roll: 809; Page: 21B; Enumeration District: 0200; Image: 971.0; FHL microfilm: 2340544. Ancestry.com. 1930 United States Federal Census [database on-line]. Provo, UT, USA: Ancestry.com Operations Inc, 2002. Original data: United States of America, Bureau of the Census. Fifteenth Census of the United States, 1930. Washington, D.C.: National Archives and Records Administration, 1930. T626, 2,667 rolls. 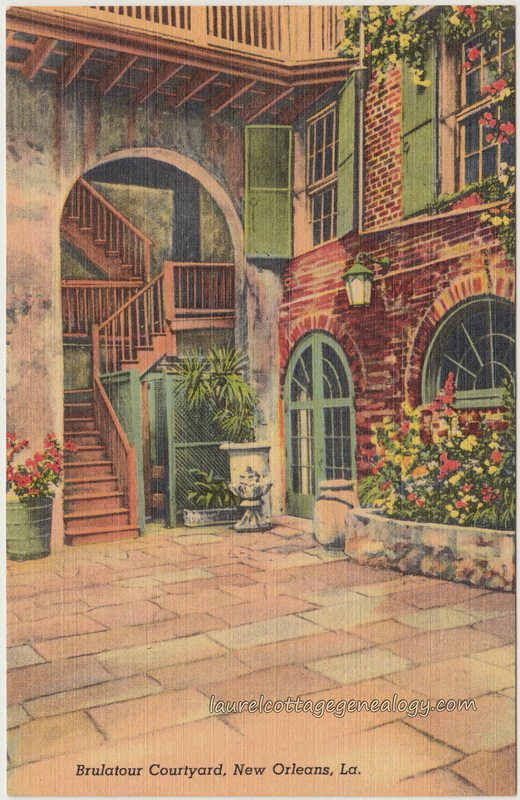 This entry was posted in Linens, Postcards Unused and tagged 200 year old water wells, A. Hirschwitz postcard publisher, Dorothy Gibson, early American film industry, Francois Seignouret, Genuine Curteich - Chicago C. T. Art - Colortone, linen postcards French Quarter, linen postcards New Orleans, Pierre Ernest Jules Brulatour, Titanic survivors by Annieoakley. Bookmark the permalink. I discovered a painting of the courtyard from 1918. Beautiful place. Thanks for your comment, Robin. That must of been a great find! My grandfather went to New Orleans and bought a beautiful watercolor of Brulatour Courtyard. The corner of the painting lists “Watercolor by R.S. 1785-1945”. Any idea who this artist may be? Hi Katherine. You might want to try contacting someone knowledgeable in New Orleans, maybe some local art galleries, auction houses or antique stores. And when do you think your grandfather would have bought the painting? A time-frame might help in your search. I don’t get what the reference would be to 1785 – 1945. Hoping someone will respond here for you, with an artist name, though. Good luck! 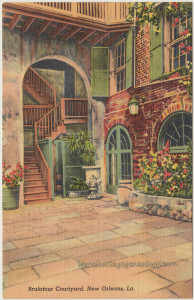 I have a painting of the Broulatour Patio that my grandparents gave me that they got on a trip to New Orleans in 1934. It’s signed in the bottom right corner Swinney. Could you give me any information about the artist or it’s value? 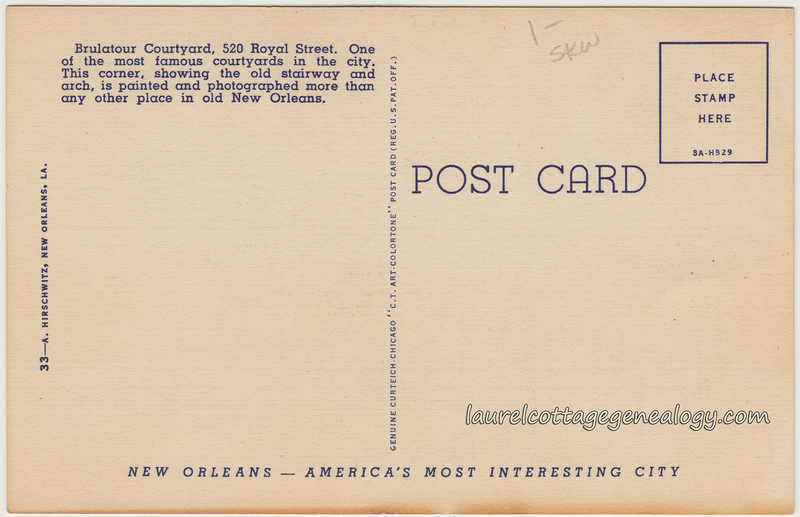 I JUST DISCOVERED A POSTCARD SIZED PAINTING OF BRULATOUR COURT – NEW ORLEANS WITH A SIGNATURE LAST NAME ENDING MASON ??? BUT HAS A “C” IN A CIRCLE. THE PAINTING IS ACTUALLY PAINTED YOU FEEL THE CURVE, ETC. IT HAS QUITE A BIT OF SILVER IN ITS DESIGN. I WOULD LIKE TO KNOW MORE ABOUT THIS PAINTING IF POSSIBLE?